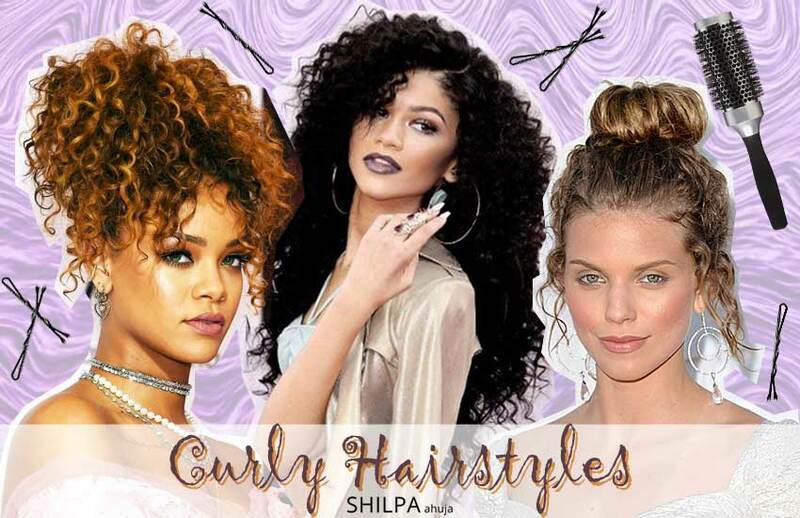 No matter what type of curls you have, our list of easy curly hairstyles and haircuts will make sure you never run out of things to try, not even on a bad hair day! Hey there! Having been a curly haired girl for all my life, I’ve learnt that styling curls is no walk in the park! From managing frizz, to losing bobby pins in the black hole that is your hair and breaking hair ties (R.I.P to my beloved pink hair tie I broke this morning), the list of curly hair problems are endless! However, with the right products a little extra care, they can turn you into Beyonce! So put your straighteners away and love your curls the way they are. Whether you’re a naturally curly girl or someone that wants to rock hairstyles with curls, we have just what you need! 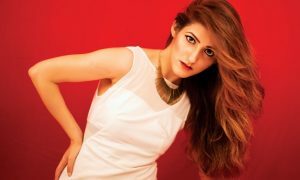 No more bad hair days and no more wondering what curly hairstyles to opt for what occasion! 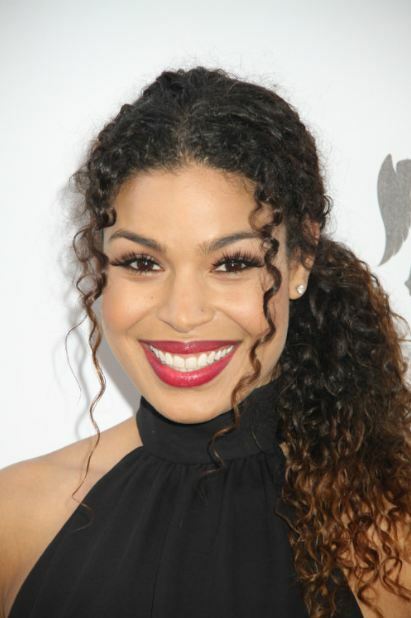 This will be your menu for long curly hairstyles for years to come! You’re welcome!! No matter what haircut you get, just make sure to ask your hairdresser to give you a dry cut. 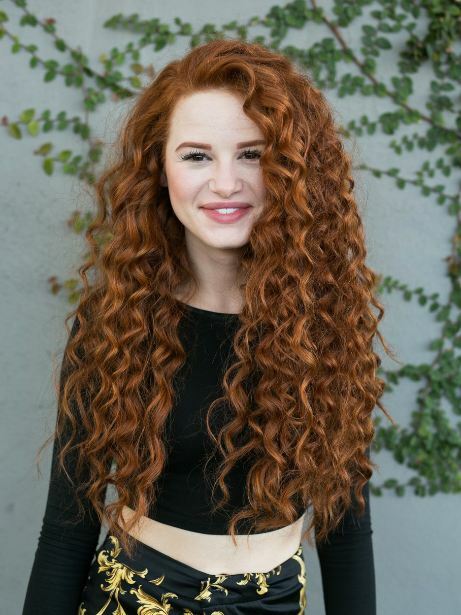 This type of cutting is best suited for curly hair as the hairdresser will know how and where each curl falls, which they wouldn’t know if it was wet. I got myself a dry haircut not too long ago and there’s been no looking back ever since! Layered Cut – This has got to be the best suited hair cut for long curly hair for so many reasons. Having layers prevent the hair from being too heavy at the bottom, which would flatten the roots. Layered haircuts for curly hair also add volume. If you have naturally thin and fine curls, this haircut will do you wonders! Layers can also help you get rid of unflattering, uneven growth and subsequent split ends. 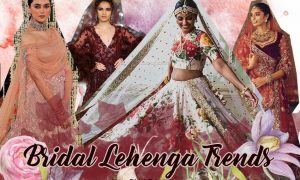 You can opt for either a tiered layer cut, uneven layers or feathered ones. Curly Hair with Bangs – Bangs along with curly hair look so adorable. In fact, I used to have bangs a couple of years ago and I gave up on it soon ‘cause straightening out the bangs everyday was such a task. But now seeing celebs rocking curly bangs in their natural state, I might give this a go again! Either way, they look great! 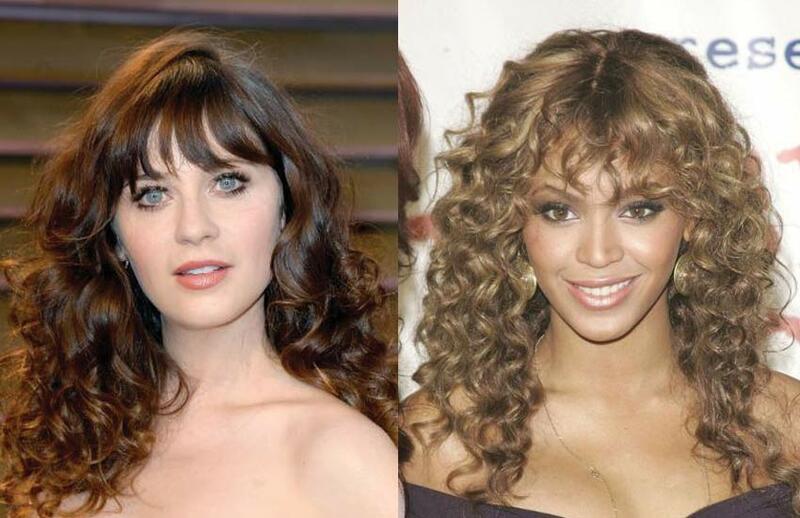 You can opt for straight fringes like Zooey Deschanel or curly ones like Beyonce. 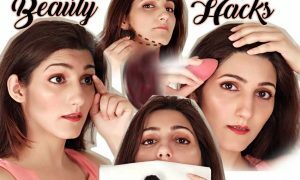 Face Framing Layers – No matter what face shape or curly hair type you’ve got, this curly haircut will never fail to look amazing. 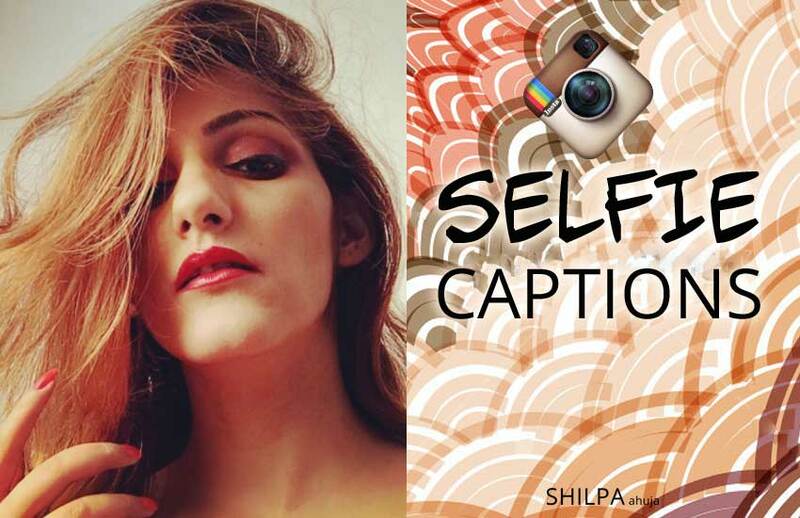 It does exactly what the name suggests – frame the face. Just below the chin is the ideal length for face framing curls. But of course, you can go a bit shorter too. Long Cascading Curls Without Layers – This curly haircut is perfect for someone who already has plenty of volume. If you don’t want your hair to look bigger than it already is, the no layers/steps look is ideal. This has been my haircut for as long as I can remember and I don’t think I’m changing it any time soon. No one has the time for elaborate fancy hairstyles each morning when we’re already running late for school, college, work or a quick night-out. These cute curly hairstyles are something you can easily do with no effort and in no time! 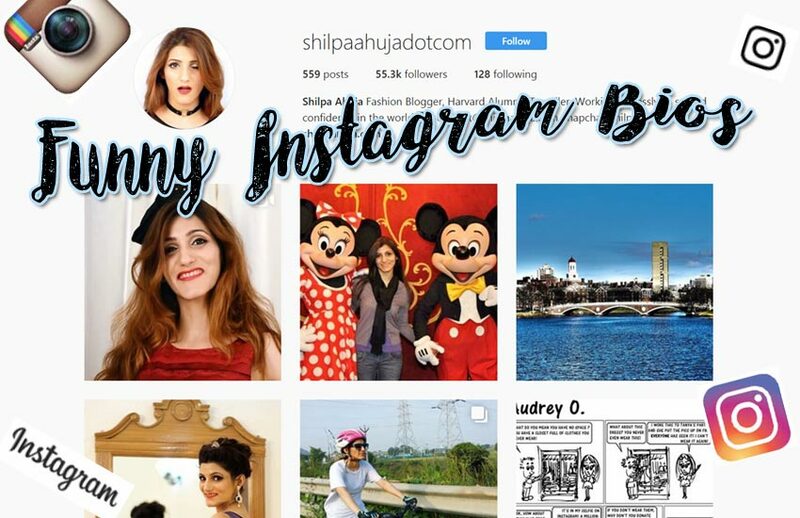 Inverted Ponytail Bun – Is it a bun? Is it a ponytail? It’s a ponytail bun! Leave it to Rihanna to don the coolest curly hairstyles ever. And it’s actually easier than it looks. Gather all your hair up like a high ponytail. Twirl them around and pin down the bunch, leaving the loose strands fall in the front. Then pin down loose stray hair at the back. Side Ponytail – A low ponytail to one side looks super pretty especially when a few strands have been left out to frame the face. I also love wrapping a lock of hair around the hair tie just like Taylor Swift has. High Pony – You can just never go wrong with the good old high pony, can you? It’s the universal lazy girl hairstyle. But it never looks like you’ve made no effort. Fishtail Braid – My favorite kinda braid out there. It’s actually simpler and easier than you think it is and it doesn’t even matter if it turns out messy. In fact, it looks better when messy! Braided Headband Look – Braid a section of your hair to make it look like a headband! Try a french or inverted braid – they’re the easiest and quickest braids to make. Punk-Inspired Temple Braid – Create a single braid at the side of your temple to almost resemble a mohawk. Poofy Hair with Headband – I love this knotted headband with a pouf that Rita Ora’s pulling off. Everyone has bad hair days when our hair just won’t cooperate no matter what you try to do! Frizz is a natural and frequent occurrence in the life of a curly-haired girl. And no you don’t have to stay indoors and hide from the world. 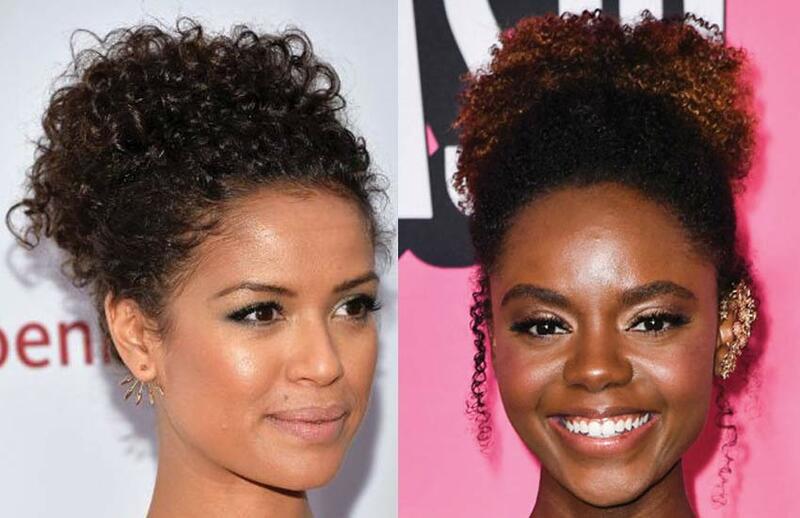 Instead, you can try these curly hairstyles that will keep the frizz at bay. Braid – Braids are a frizzy haired girl’s best friend. It keeps all your hair held together and what’s more, when you take out the braid later, the frizz is almost gone and your curls look more like beachy waves! And there are so many types of braids with curls – so choose whatever you’re in the mood for! Hair Accessories – Accessories like beanies, bandanas, hats and turbans will cover for you on any frizzy hair day. Try colorful or printed ones so they take away all the attention away from your hair! You could also go for toothed side clips on one side to give your hair a softer look. 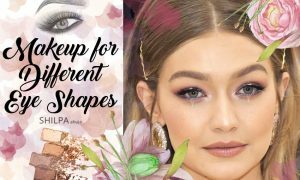 Try Gigi’s colorful one or Georgia May Jagger’s simple and minimal one. Pony with Temple Braids – Perfect way to jazz up a regular pony! Making a couple of braids one one side or both and tying it into a high pony is a great curly hairstyle for long hair. Thin Braids – Have a date but your hair’s being frizzy and annoying? Creating braids here and there in your hair is a great look. In fact, you can take just the frizzy sections of your hair and braid them alone. Big and voluminous curly hair is what all the it-girl have been sporting lately. It takes a lot more patience and effort but the results are so worth it! Overnight Braid Curls – Microbraid your hair before bed, wake up, take ‘em out and your hairstyle for the day is done! It almost gives a crimped-like effect and makes your hair look bigger. I love Amandla Stenberg’s version of this curly hairstyle. She hasn’t taken out her hair completely out so you can still see the braids at the roots. Brushed Out Curls – Having a frizzy day? Or don’t have time to style your hair? Brushing out your curls is your best bet. In just a matter of minutes, you can get big curly hair. 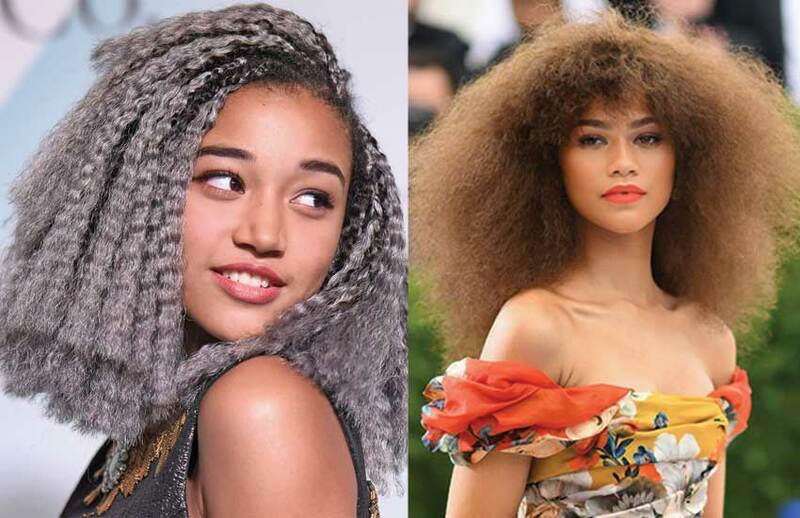 From Christina Aguilera in the early 2000s to Zendaya’s 2017 Met Gala look, the brushed out hairstyle is a popular curly hair trend. If you thought styling curled or permed hair was hard, try living with naturally curly hair! If you have natural curls like I do, you know creating cute curly hairstyles is a big deal. Check out our list below for some easy DIY inspiration! Half Up Half Down – What better way to keep your hair out of the face? Low Ponytail – The low pony never gets as much love as the high pony and I wonder why? It’s just as pretty and just as quick to do! Micro Braided Pony – A little time-taking curly hairstyle but completely worth it! 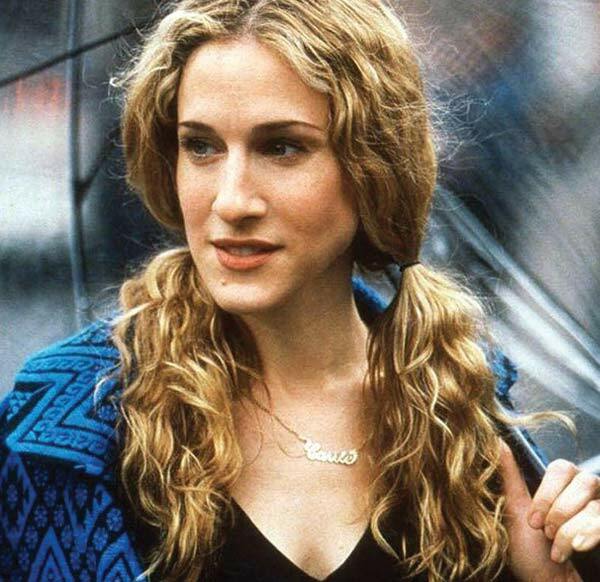 Pigtails – Pigtails are not everyone’s favorite but if Carrie Bradshaw donned this look, we need to consider it. 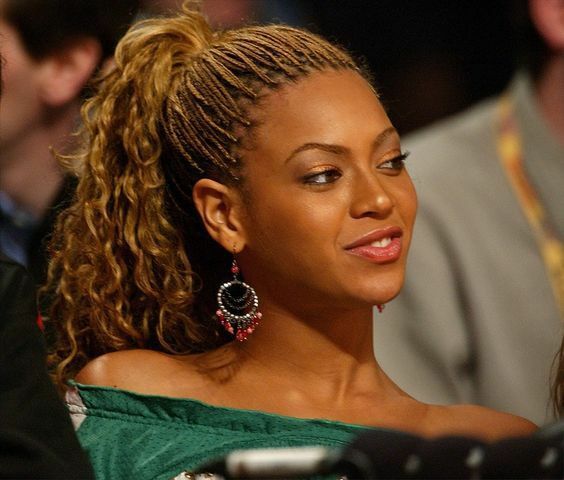 In fact, pigtails and low ponytails would be the quickest hairstyles for thick curly hair. Can’t decide if you wanna let your hair down or up? Go for the half up and half down hairstyle. These types of curly hairstyles are awesome ‘cause you get to leave your hair down and also away from your face! 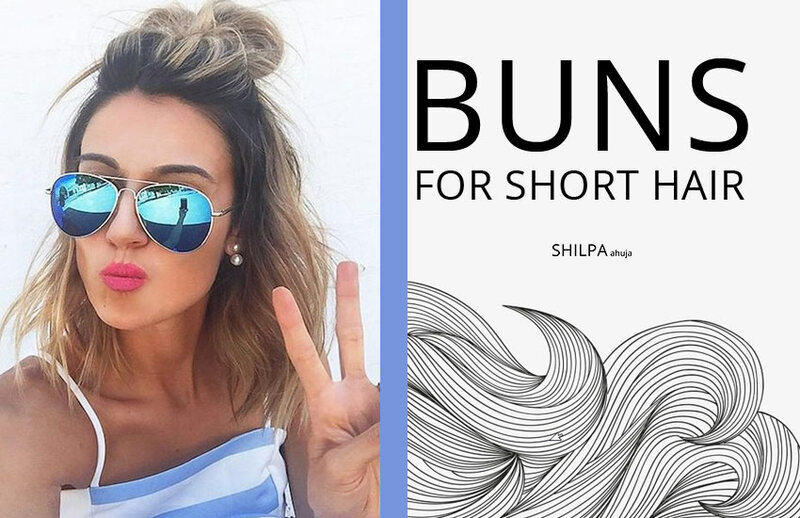 Half Bun – My forever favorite curly hairstyle! This cute yet easy hairstyle will never let you down. All you have to do is section your hair into two parts. Tie the top half into and bun and leave the rest loose. So effortless and cool! 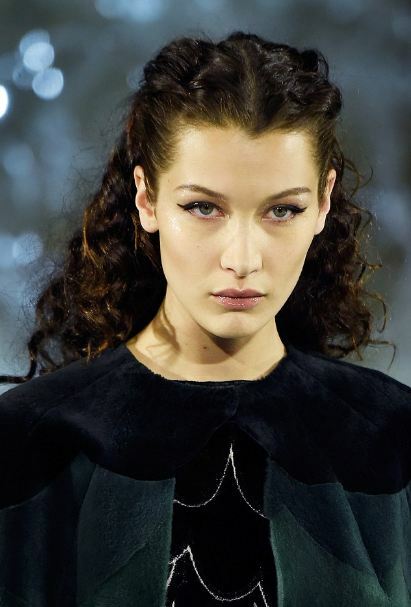 Centre-parted Pinned Back Look – We’re loving Bella Hadid’s runway hairstyle, which consists of a centre parted hair that’s twisted and secured in place with bobby pins on either side. I need to give this curly hairstyle a try! Side-Swept with Volume at the Crown – For this curly hairstyle, leave a small section of hair on one side and comb the rest back into a pouf and pin it down. Now, sweep the left out section to the opposite side and pin. Slicked Back Half Up Hairdo – This one’s my favorite out of these stylish curly hairstyles. I like having it slicked back without any volume ‘cause then then you wouldn’t be dealing with too much volume at the top and bottom. When it comes to bangs for curly hair, there’s so many gorgeous variations to choose from! Blunt Bangs – The most standard and basic type of bangs, it’s a style of thick fringes that are cut in a straight line. Rounded Bangs – These bangs are longer at the sides and shorter at the centre, forming a curve. Side Bangs – Asymmetrical fringes swept to the side look edgy and cool. Wispy Bangs – Thin and feathered, these are perfect for fine hair. Short Bangs – Bangs are usually eye-skimming but these ones are a lil bit shorter. Curly or straight, they look great! 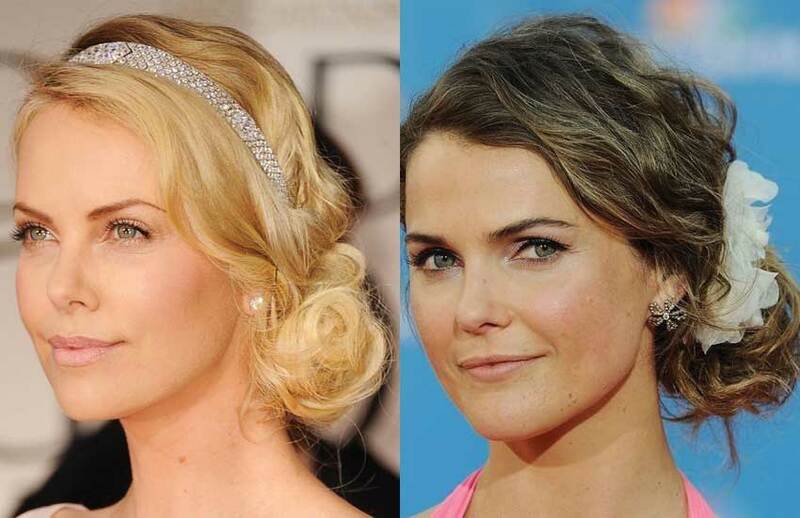 Updos are not just for special occasions, they can be pulled off casually or even for work! Curly Messy Bun – No matter what kind of a bad hair day you’re having, a messy bun with curls will always come to your rescue! And it’s one of the easiest curly hairstyles out there. Just tie your hair up into a super high ponytail with a scrunchie, twist the pony and wrap it around the scrunchie. And secure with some bobby pins. You can also add a headband. Pinned Up Curls – A shorter and neater version of Rihanna’s inverted ponytail bun, I’m in love! Great for the office! Medium curly hairstyles look great at parties, giving the romantic, glam look. 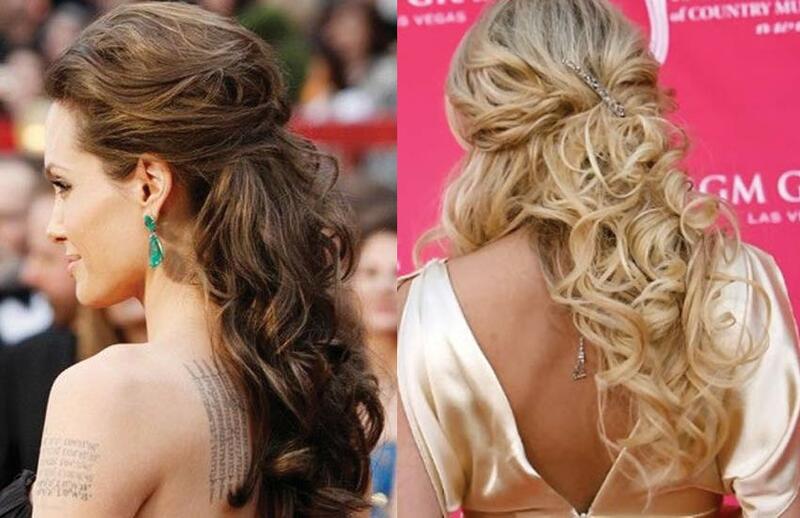 Dance the night away at Prom or Homecoming in these trendy curly hairstyles! Low Bun with Accessories – Make a low messy bun at the back and add a huge flower or pins just above it. With a strapless gown for prom, it’d look amazing! Crown Braid – Try a fishtail or dutch braid at the crown and keep the rest of your hair tied into a ponytail or bun or just leave them loose. You can also add rhinestone pins within the braids. French Twist – A classic french twist at the the back never fails to look good with evening wear. Double Braided Low Side Bun – Elegance at its best! Side Twist Bun – Twist your hair on either side into a bun at the back leaving some curls out to frame your face. Retro Side Bun with Bangs – The classics never go out of style! 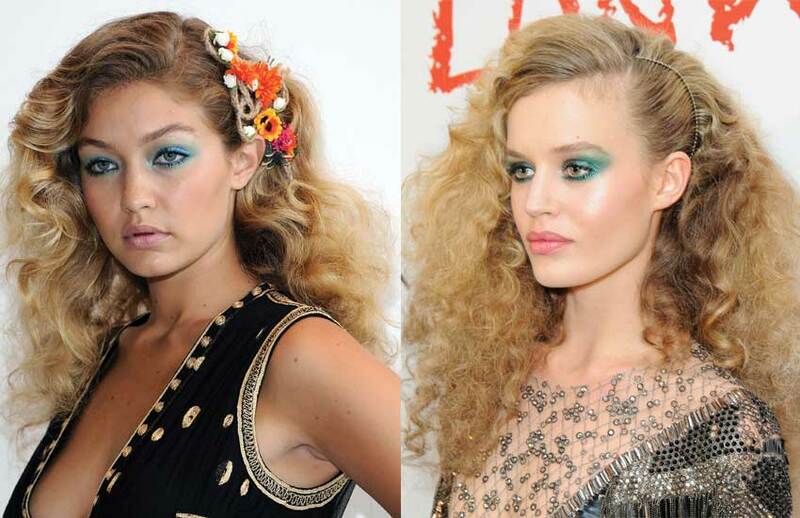 Bombshell Waves – This glam curly waves look is perfect for a school dance. Whether it’s your big day or you’re a bridesmaid or a guest at a wedding, these chic curly hairstyles will make you look and feel truly special! 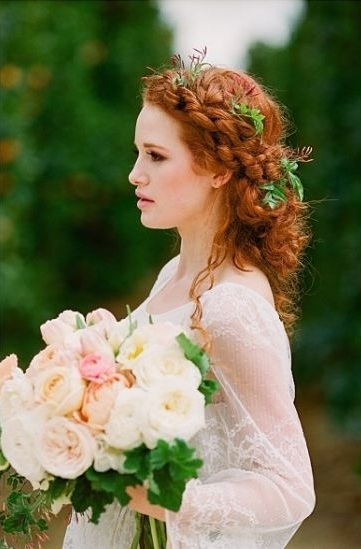 Twisted Braid Updo with Leaves and Flowers – What a perfect curly hairstyle this would be for a garden wedding! Chignons with Accessories – Chignons have always been a bridal favorite. Personalize your chignon with your favorite accessory such as a flower, embellished slides, headbands or pins. 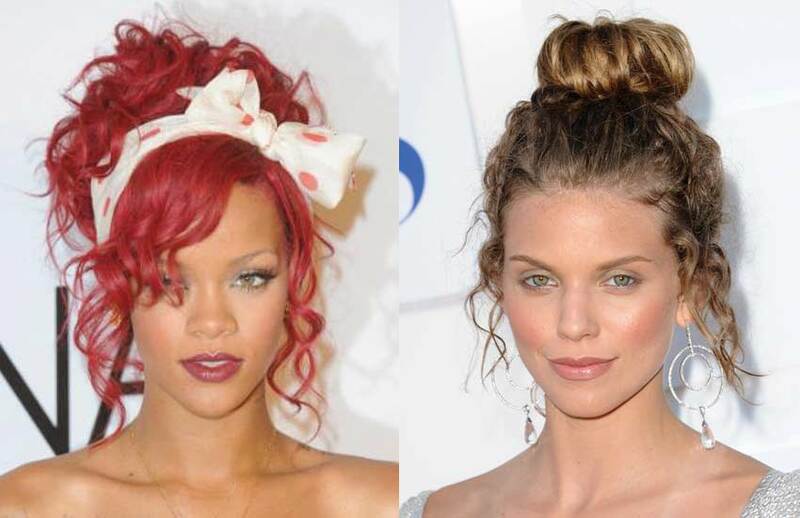 High Bun with Pouf – If you’re wearing a big poufy gown, go for a huge bun to match! Buns are foolproof no matter what the occasion. Try a high bun with lots of texture. Add some embellished combs or pins if you want. 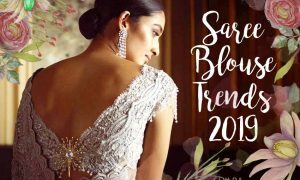 If updos are not your thing for wedding curly hairstyles, try these elegant half up half down looks! 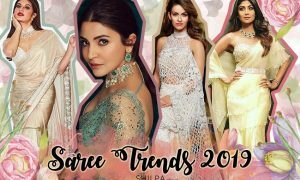 – 11 Fringe Hair Cuts & Styles to Try That’ll Give You a Makeover!